Life isn't easy for a butterfly, or for moths. 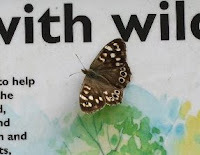 We met this brave old Red Admiral on a lovely walk up the Wharfe from Addingham and then back through Lob Wood, with its murk-enshrouded old rail track, victim of Beeching, and then over the brow of the hill above Farfield Hall and its ancient Quaker meeting house. Look what a battering the Red Admiral has had, but it was still flying gamely around. 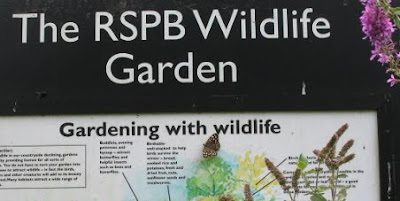 Actually, it attracted my attention because it clearly wasn't a Gatekeeper or Wall butterfly - too much colour - but it had none of the swooping and soaring of Red Admirals or Small Tortoiseshells in their prime. Once it settled, I saw why. It's like one of the half-wrecked bombers which used to limp back to Yorkshire airfields during the Second World War. In Lob Wood, I took this pic of a Peacock at rest. The flash worked automatically and lit up the strange, scorched pattern. Compare it to the vivid overwings of the Peacock in the post four below. What an interesting natural history lesson. One insect, two defences: the overwings with bright warning colours and fake 'eyes' to scare off predators; the underwing camouflaged to make the insect invisible, like an old fallen leaf. Yo! This is blog post 200 according to Google's infallible stats. A break now, though, because my older son and his lovely bride are getting married, and moths take second place to that. (Though, who knows, one may flutter by to bless their happiness). I'm very much enjoying this book at the moment. 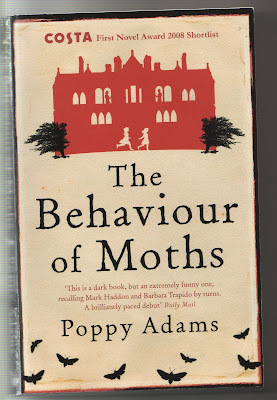 I won't give away the story, but I must just tell you that it has one moment dear to my heart: when one character gives another one a Robinson moth trap. This is what happened to me, thanks to Penny's thoughtfulness, and much has followed from that. Actually, I gave this book to P, and am doing the traditional thing of reading it first - with the good excuse that she is working her way through all manner of choices from her reading group. Anyway, you don't have to be remotely interested in moths to enjoy it, although there's plenty of mothy stuff in there, if you are. I hope that I am not like the man who gets the trap, though. Say no more. 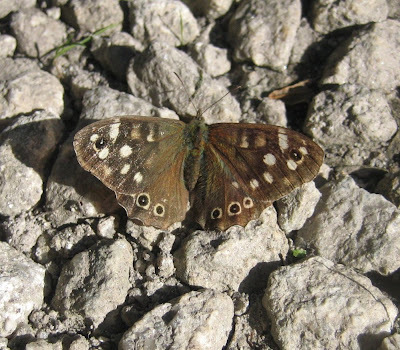 The weather is too dodgy to trap at the moment, but sunshine during the day brings swarms of butterflies. Much as I'm absorbed by moths, I agree with 99.9 percent of the world that butterflies are lovelier. Check out the Peacock two posts below, or look at these Painted Ladies. The different flying methods, or abilities, of the two butterflies are interesting. The Peacock floats about unless alarmed, whereas the Painted Lady is powerful and purposeful all the time. Both can become completely absorbed by the nectar of buddleia, however, and this Painted Lady posed patiently for my photographs for at least two minutes and was still feeding greedily when I had finished. 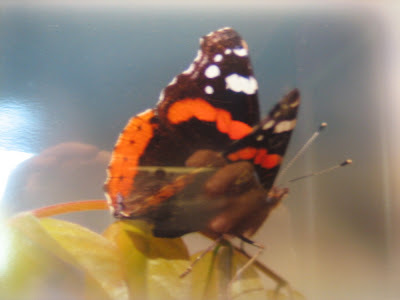 I will never forget seeing my first Painted Lady, at Harlow Carr gardens in Harrogate when I was eight. They were unusual in Yorkshire in those days but are common now, albeit as immigrants from the Continent which breed here in the summer but do not survive the winter. They often arrive in huge numbers, sometimes spectacularly so, as happened earlier this summer when they made headlines in the media.